Cramped houses can make you feel claustrophobic. But, a little creativity and implementing thoughtful interior design ideas for a small house can transform your home into a spacious, more lovable place. While designing or revamping your house, think of all the things that you need in a specific room. For example, you need a bed, an almirah, a book shelf and other essentials in a bedroom. Once done, scan your room and dedicate separate zones for each of these things. When it comes to small bedrooms, utilize every bit of extra space. Turn your empty corners into useful places. Install smart furniture and fixtures like small closets which can be used as simple and efficient work stations. Add some shelves above the desk area and you can conveniently store all your office books and papers. Alternatively, foldable wall-desks are also a great idea. They not only take up less space and allow more area for you to walk around but serve as handy tables when you want to work. 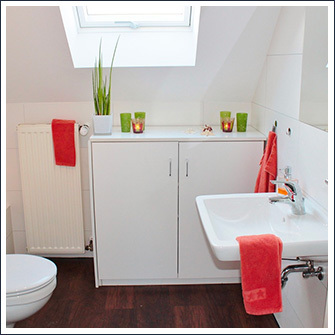 Narrow wall shelves make for excellent storage spaces, especially in case of small bathrooms. Purchase some attractive storage boxes or canisters for stacking cotton balls, lotions, swabs and place all your unsightly toilet essentials under the vanity. This small home interior design is smart hack to create addition storage. One of the best ways to make any space appear larger is by adorning it with lighter colors. A textured focal wall for adding a punch of color with the rest of the walls painted with light colors and decorated with matching furniture. It is the perfect way to make a room look spacious. Another great way to make small rooms appear more spacious is by adding floor-to-ceiling window treatments. Most architectural house designs for small spaces generally include floor-to-ceiling windows, especially in living rooms and dining areas. They automatically make rooms look larger in size. It’s great to have some natural light that illuminates a room. Whether you need some extra shelves for storing your books and displaying decorative items or have small kids with a lot of toys, creatively utilize the space between two rooms or under the staircase and turn them into storage spaces. Convert empty corners into personalized art galleries, maybe a mini library or even a bar counter. Just make way for your imagination to do wonders. 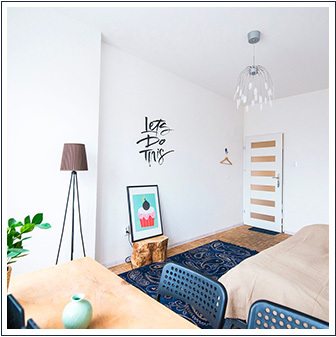 Think of out-of-the box interior design ideas for small flats and transform them into beautiful homes.